At Micromeritics, quality and customer service continue to be our top priority. 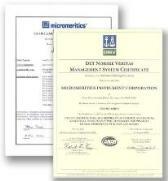 Micromeritics has gone to great lengths to achieve and maintain compliance with standards bodies such as CE and ISO. By maintaining industry standards and continually reevaluating our internal processes, we are able to produce a higher quality product for our customers and quickly adapt to changes in the industry. We are dedicated to ongoing improvements and quality and customer satisfaction at all levels of our operations. The CE mark was created by the European Union (EU) to unify the compliance standards of member countries. Provisions contained in various EU directives must be satisfied before a product can receive the CE mark. Products that do not qualify for the CE Mark may not be imported by member countries of the EU. Micromeritics has been active in testing our products to meet the CE Mark directives. All of the products listed below qualify for CE Mark certification.